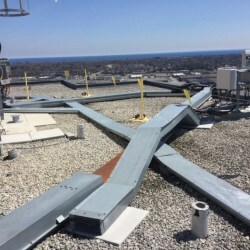 Roof work can be dangerous at any time, but sometimes going the extra step and providing a Roof Warning Line System is required to let workers know the exact location of roof edge when they inadvertently get too close. All of our warning flags are non-penetrating and portable and are OSHA approved. The PermaLine Warning Line was designed for permanent placement of a roof warning line system for roof edge fall protection. Once in place, the PermaLine remains intact until you want to move it. The Tech-Flags Warning Line is the answer for permanent rooftop warning flag systems. 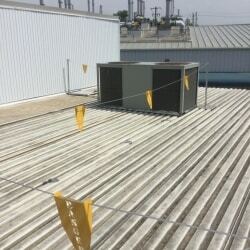 These are OSHA compliant warning flags and a cost-effective option for creating free standing roof edge protection control zones.